I precooked the mince on the hob, but if you have a sauté function on your soup maker you could make a little less (200g) and do it all in the soup maker. Some people worry about pasta sticking to the bottom of the soup maker and burning, but I’ve never had this issue. I would suggest making sure you have ample liquid in your soup maker, and by that I mean stock or water rather than just passata or pasta sauce. I have heard that just tomato based liquids in a soup maker can cause it to burn. Another question that often comes up is when to put the pasta in. Should it be at the beginning, 5 minutes before the end or should it be cooked separately and then stirred in? The answer is any of them, and it depends. 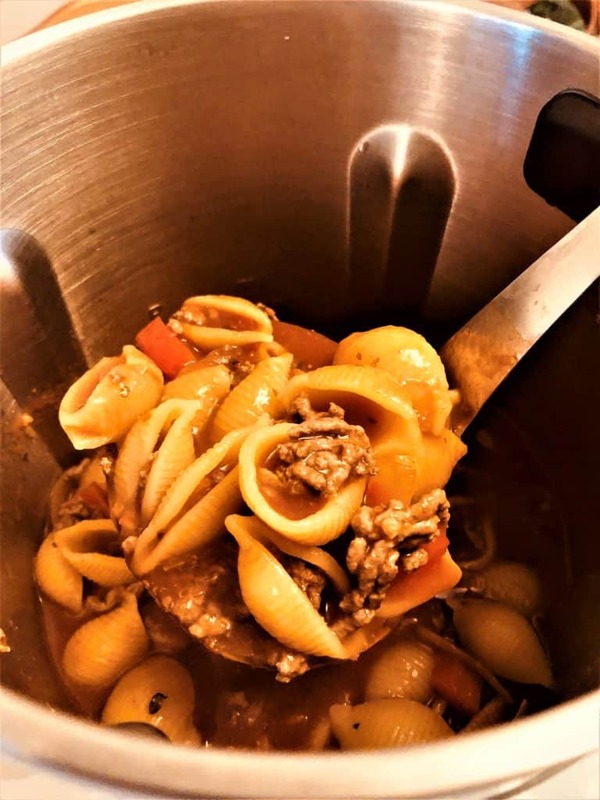 For this particular soup I used Conchiglie pasta which is larger than regular soup pasta. The packet instructions for the pasta suggested it needed boiling for 10 to 12 minutes, so I figured this would be just fine for the soup maker. 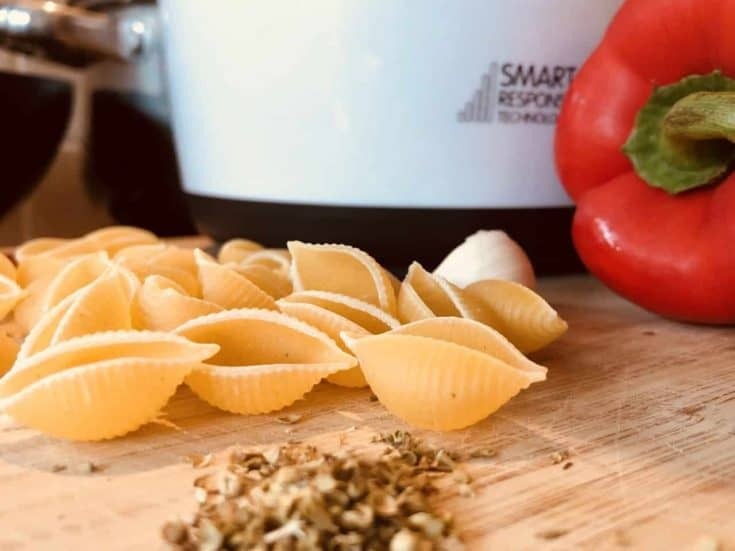 If I was cooking say fresh pasta, or smaller shapes, I would stop the soup maker about 5 minutes before the end of the cycle and add it in then. Of course it all depends on how soft you like your pasta. 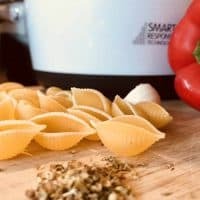 The only time I would personally add my pasta cooked at the end of the cycle would be if I wanted to make a smooth soup. 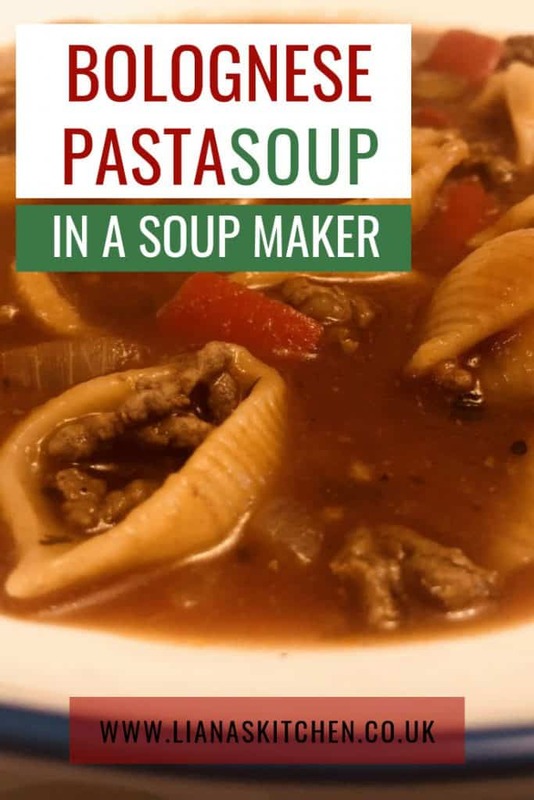 I have a number of other pasta and rice based soups I am experimenting with in the soup maker, as soon as they are ready to share I will put them up here and also on my FB group. If you would like to know when the 2nd soup maker book is out just sign up below and I’ll let you know. It is usually free to download on Kindle for the first few days (the paperback version is priced as low as possible during this time too). Optional: sauté onion, garlic & pepper in olive oil. Add all ingredients to soup maker and stir thoroughly. Top up with stock if needed (I used 1 beef stock pot in 700ml water). Make sure you give everything a good stir before setting the soup maker off, just to ensure there is no pasta stuck to the bottom. Tastes lovely with cheese sprinkled on!